While the prime minister has been extolling the virtues of the Jan Dhan Yojana and Mudra Yojana at the Buenos Aires G20 summit, farmers are rallying in Delhi for a solution to their crises. They are demanding implementation of the MS Swaminathan Commission report. At this juncture, is it fair to claim that the present government’s schemes were successful at the domestic level? 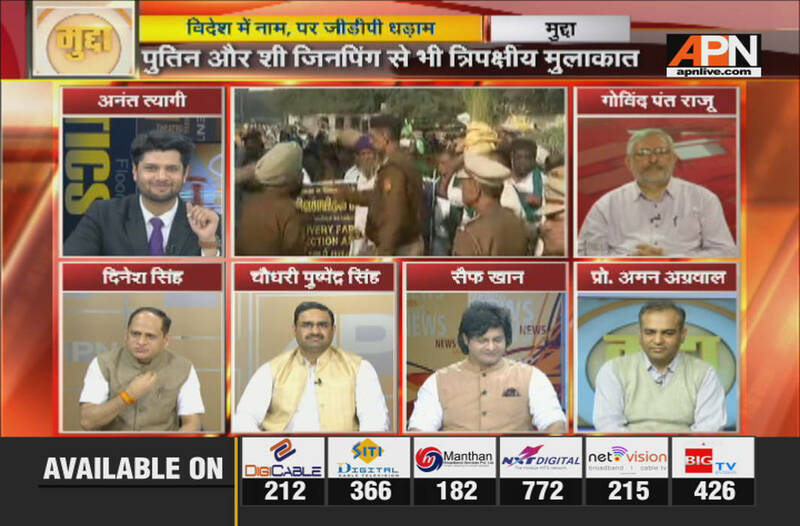 Saturday’s edition of Mudda tried to answer this question, with Anant Tyagi leading a discussion among BJP spokesperson Dinesh Singh, Congress spokesperson Saif Khan, farmers’ activist Pushpendra Singh, academic Prof. Aman Agarwal, and Govind Pant Raju, senior journalist. “The growth rate has been 7.1 percent, and 8.1 in the last quarter. The rupee is climbing. In the last one and one-and-a-half months, the RBI, too, has reached an agreement with the government to solve some issues,” said Dinesh Singh. A 1.5 lakh crore loan waiver has been given to farmers every year. But agitating is like a drug to them. The GDP is still growing, albeit at a slower rate, said Agarwal. Raju felt that Modi has been doing well to present his best foot forward at foreign summits. “China is a force in South China Sea. So this exercise is necessary. Just because Modi is good at naming schemes, the opposition calls him a jumlebaaz (tall talker),” he said. Khan then said while China has a 14 trillion strong economy, its GDP contribution is 10 percent as compared to our 7.1 percent GDP growth rate. “Look at our agricultural growth rate, manufacturing growth rate, mining growth rate (which is at -2.4 percent from 6 percent). The economic secretary, Subhash Chandra, has himself termed the figures disappointing. The RBI, too, has admitted slow growth for the last four years. Today, the agricultural growth rate is 3.8 percent, down from 5.2 percent during the UPA tenure. This is the reason behind the massive number of farmer suicides,” he said. Pushpendra Singh was affronted by Agarwal’s assertion that farmers had been given 1.5 lakh crore loan waivers each year. He maintained that a waiver of Rs 6,000 crore was given in 1990 and a total waiver of Rs 2.1 crore during the 10 years of UPA rule. “Yet it is the farmers who give the government grain at subsidised rates. The minimum support price (MSP) of rice is Rs 1,750 per quintal; it is Rs 2,500 in a country like Bangladesh. Agarwal should explain himself,” he said. Raju held that the government did make its own efforts even if they proved unsuccessful. Pushpendra Singh pointed out that according to calculations, MSP for rice should be Rs 2,340. “Modi gave us the warehousing dream. It remains unfulfilled. Also, middlemen continue to rule the roost,” Raju then said. Is the idea of an online system to sell produce in essence cheating the farmer, Anant asked. Most of them are illiterate and poverty-stricken, he reminded the audience. Pushpendra Singh then went on to raise two more points. He said that the crop insurance schemes need to be looked into. Also, MSP for sugarcane needs to be revised at the earliest as farmers, overburdened by inflation, have been selling the cane at the same price for many years now, and are badly in need of succour.